I love this idea! 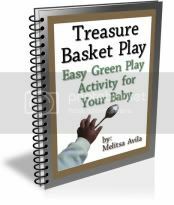 My friend Melitsa has a great ebook out called “Treasure Basket Play“. If you’re tired of plastic toys or toys that are so passive that you’re baby doesn’t have to “think” to play then this book is definitely for you! What do you do with this active, sensory seeking baby who puts everything in his mouth and his attention span is very short? You want your baby to be curious and make discoveries whilst playing because you know it’s the best way to learn. They love to put everything into their mouth. Whether they are sitting on your lap or on the floor, they find it! What can you do about the mouthing? They enjoy the movement and feel the motion. Little scientists testing pull, testing teeth, banging, feeling, experiencing the world around them…testing your patience. You notice he’s drawn to everything that is not a toy; the spoon you are holding, the envelope or discarded newspaper swiped from the table, his blankie. He pulls at the grass over and again. Yet he stays still listening to the loud landing of birds in the nearby trees. Take a look over at Melitsa’s sight and if you have curious little ones, get the book – you’ll be glad you did! Childhood obesity is a concern for parents and health professionals alike. In an effort to combat it, doctors recommend making sure your children learn to be active at an early age so they’ll continue being active as they age. Teach your child these eight fun games for preschoolers to keep them active. 1. Hopscotch is a game that children have played for years. Draw a pattern of eight to twelve squares on the sidewalk with chalk. The children will place a rock or button in the first square, hop over the square with the rock, and then jump in the rest in sequence. At the end they’ll turn around and return, picking up their rock on the way. They’ll try to get the rock in each square until they get to the last one. They lose their turn if they step in the square with the rock. 2. Duck Duck Goose is another game you can play with your preschooler. Start with friends, family, or stuffed animals, sitting in a circle. One person is chosen as “It” to go around the circle, tapping each person on the head as they say “duck.” When they say the word “goose” that person gets up and chases them around back to their place, and they become it. 3. Most children have played Simon Says before. A group of children, or adults, stands in a line and “Simon” gives them instructions. As long as the phrase “Simon says” is given before the instruction, the group does what Simon says. If Simon says to do something but fails to say “Simon says,” the person who still does it is out. This continues until only one person is left and they then become Simon. 4. Tag is another game that’ll get your preschooler moving. Several children are chased by one child who is “It.” This child will try to tag the others, which will make the tagged child it. The children can play for as long as they’re having fun. 5. Bug Hunt is a game you may not know. Find pictures of bugs (ladybugs, ants, crickets, butterflies, etc.) and glue them to index cards. Give each child two or three cards and let them try to find those bugs. 6. Traffic Light (Red Light, Green Light) is a game where children are lined up on one end of a yard and another child plays the “stop light.” As soon as that child turns away from the others and yells “green light,” the other children move forward and try to reach him. The children must stop when the stop light turns and says “red light.” The child that reaches the stop light first then becomes it. 7. Help your child with a Treasure Hunt. Hide a gift and then create a treasure hunt where they’ll have to go around the yard or house, go through boxes, up and down stairs, to find their treasure. 8. Musical Chairs is another game that children love to play. Of course you’ll want to have a number of children (or adults) to play, as well. A circle of chairs are placed in a room, seats facing outwards, with one less chair than the number of children. Music starts and the children walk around the chairs; when the music stops the children try to find a seat. The one left standing is out, another chair is taken, and the music begins again. Take time to play any of these eight fun games for preschoolers to keep them active. You’ll both have fun and your child will learn how to remain active and fight obesity.